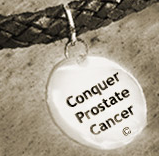 Conquer Prostate Cancer Now: Prostate Cancer vs. Breast Cancer - Why Men Can't Get Their Act Together? Prostate Cancer vs. Breast Cancer - Why Men Can't Get Their Act Together? Prostate cancer is less of a cause-related issue for men than breast cancer is for women. That at least seems to be a view that's bandied about by men who wonder why government funding is not as substantial for prostate cancer research and awareness compared to breast cancer. Why that's the case is anybody's guess, although I'd like to offer some thoughts on this matter. First I'd like to point out that many folks argue that breast cancer is a "sexier" cause than prostate cancer. This makes sense in a society where men and women are culturally fixated on their appearance - in particular their breast or chest size and shape. In contrast substantially fewer people know what and where the prostate is or how it functions. Besides, as I've heard some state, prostates are hardly as pretty a sight as breasts. Still I would argue that the primary reason the cause of prostate cancer has not gotten equal time with the cause of breast cancer is less a question of aesthetics and more a matter of organizational effort. For instance, prostate cancer advocacy organizations tend to put more emphasis on fund-raising for research as opposed to money raised for prostate cancer support and education. Because organizations are competing for money, there are more turf issues. As an example the Prostate Cancer Foundation in the U.S takes in the more funds than other prostate cancer organizations, while their website takes credit for most recent research advances. At times this can be regarded as sheer hype in order to raise more funds from the general public. There's no question that on occasion the PCF and other prostate cancer or community-minded organizations continue to raise prostate cancer awareness together, but this is the exception to the rule. Another illustration of organizational preference for focusing on breast cancer involves the American Cancer Society - the single wealthiest non-profit in the USA. It appears to put more of its efforts into breast cancer concerns than prostate cancer as part of their organizational culture. If anything their medical leadership is currently doing its best to discourage routine prostate cancer screening and biopsies with the claim that this saves few lives and leads to over-treatment and more ED, incontinence, pain and stress. More recently the ACS has raised questions about the value of mammograms, but it has now backtracked and affirmed screening for breast cancer is vital. I also believe, as noted elsewhere in this blog and in a couple of my more recently published articles, that women need to acknowledge that prostate cancer is their problem too, since what happens to men deeply impacts on women. Contrast this to more and more men - perhaps enlightened by their wives, who seem to more readily acknowledge that breast cancer concerns require their support. A prime example of this are NFL players who wear pink shoes on the playing field during October - National Breast Cancer Awareness Month. It's clear that men - whether we're prostate cancer survivors or not, can learn a lot from women's innate tendency to embrace each other and their shared dilemmas conceptually and fiscally. Besides this, it's evident that women, in places like the USA, Canada, Israel and many other countries, tend to be family healthcare leaders and "gatekeepers." By contrast men need to do more to take greater responsibility for themselves and personal health issues like prostate cancer, which they often push under the carpet. The day will come when an increasing number of men will learn that a real man tackles things head-on, including his most private health concerns. It's time we got our act together.